Our articles on recycling the parts out of old consumer goods are very popular – so here’s another. 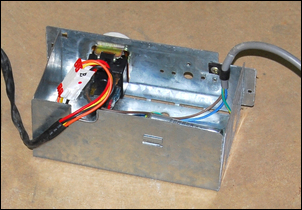 This time we’re tearing apart an old household air-conditioner – another item possible to pick up free or for only a nominal cost like a few dollars. The example air-conditioner was a small unit – but much the same technology applies to all air-conditioners, irrespective of their size. Note that we’re talking here about refrigerative air-conditioners, not evaporative. Most discarded air-conditioners are still ‘gassed’ – ie they contain in their system pressurised refrigeration gas. Before pulling one of these air-conditioners apart, check local laws about releasing the gas into the atmosphere. Also, whenever cutting a gas line (even if you have already cut a line elsewhere in the unit), place a rag over the top of the tube to shield your face from any gas or oil that might be shot out at high speed. For the same reason, it’s a good idea to wear goggles and to work outdoors. OK, so what good bits can you find in an air-con unit? One of the best parts is the internal fan, its motor and controller. Most often, a single motor is used that has a long shaft. 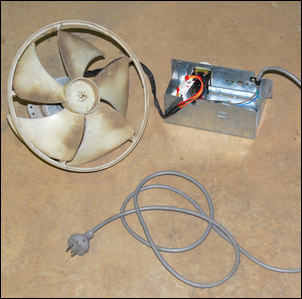 On one end of the fan is the axial fan (shown here) and on the other end is a squirrel cage fan (not shown). The fans are easily removed from the shaft, so you can leave in place just the one you want to use. Make sure that you keep all the wiring intact, including the starting capacitor. 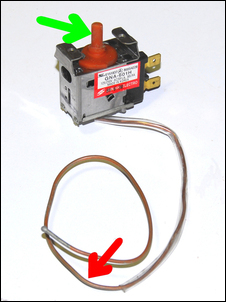 In this air-con unit, the same starting cap did duty for the compressor motor and the fan motor – just unhooking the compressor wiring allowed the fan to be used on its own. What you’ve then got is a multiple speed electric fan that is surprisingly powerful (it needs to be, to push air through the heat exchangers) and is quiet. It’s ideal for a workshop fan, blowing away soldering or welding fumes, or even just cooling you. To put it into use, all that needed to be done with this fan was to place a lid over the control box (so shielding high voltages from unwary fingers), mount the box and the fan and then just plug it in using the intact cable and plug. Another useful item is the thermostat. This is a click-action design where the temp can be set with the knob. (Here the knob is missing; it goes where the green arrow indicates.) The sensing tube is copper and can be carefully bent to suit the application. When the section of tube past the clear plastic sleeve (red arrow) is heated or cooled, the thermostat will click over appropriately. The designs will handle quite high currents so can directly control pumps or fans or heaters. They’ll work around room temperatures – say 5 – 30 degrees C.
But for my money the best parts salvageable from domestic air-conditioners are the heat exchangers – the evaporator and condenser. These are copper-cored with aluminium fins and have enormous heat transfer abilities. They also tend to be fairly thin (eg one or two rows) and so can be used ahead of other heat exchangers without unduly impeding airflow. 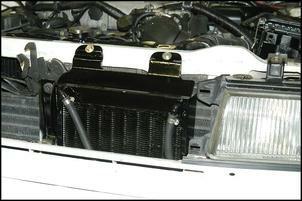 The smaller of the two heat exchangers shown here is about 400 x 200 x 40mm – an ideal size for use on a car as a fluid cooler. And in fact, that’s what has been done here – an old air con core has been used to make a very high efficiency auto trans cooler. Go to Cooling the Trans for more on this approach. 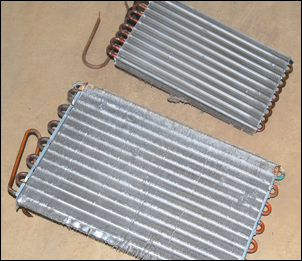 These heat exchanger cores can be used wherever a reasonably low flow but high efficiency heat exchanger is needed – another car use is as the radiator for a water/air intercooler. 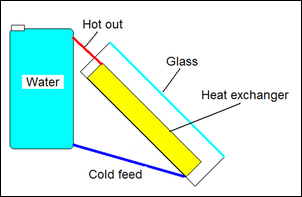 I once built a very effective small solar water heater using an ex air conditioner heat exchanger. The core was spray painted matt black, placed in a box behind glass, and the whole assembly inclined from the vertical. A reservoir (an old bucket) was located with its top level a little higher than the highest part of the core and then the system was filled with water. The water happily thermo-syphoned, over a few hours making the water in the container quite warm – and certainly warm enough to wash in. Finally, there’s always some good hardware than can be salvaged from air conditioners. 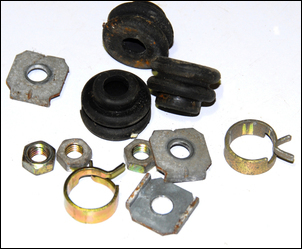 In this case, because many of the screws were rusty, I actually chucked a lot of it – but that still left me with three soft rubber mounts, three nuts, some square washers and some heavy duty spring clamps. Especially if you have a use for the heat exchangers or fan, a domestic air conditioner is always worth snaffling and pulling apart.